During the 18th century in France, the art of 'Painting inWood,' or marquetry, was developed to an extremely high level by a small group of artisans. The secret, guarded for generations, was the unique tool utilized called a "chevalet de marqueterie". 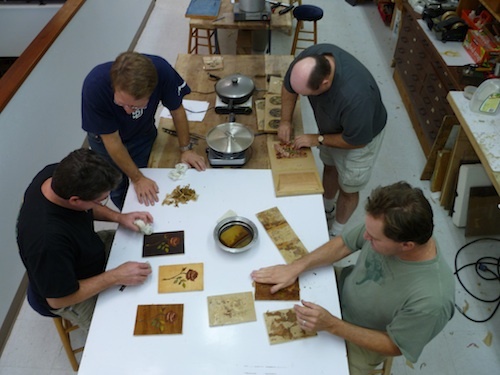 The American School of French Marquetry is located in San Diego, and offers classes focusing in the traditional French 18th century marquetry technique as well as in the newest methods for contemporary designs. 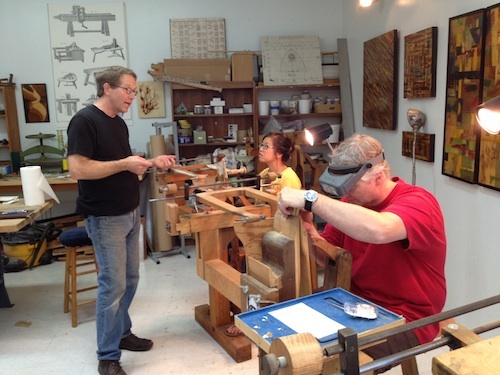 All students at the American School of French Marquetry are taught on the "chevalet de marqueterie" (Marquetry Easel for Painting in Wood), or cutting horse. It was the tool used by the Parisian "ébéniste" and "marqueteur" and was unique to the French trade, which was very secretive. The chevalet allowes the worker to cut out very delicate patterns in exotic woods and other materials with a high degree of accuracy. The best way to learn how to make marquetry is to practice "study pieces". These exercises, starting with the basics, quickly teach the method, allowing the student to gain confidence and an understanding of the process. The American School of French Marquetry has positions for 7 students on individual "chevalets". Students are provided with all the tools designs and materials as well as a handbook to complete the classes. The cost of the program is $750.00 a week. Students must register in advance and can be assisted in finding hotel accomodations. 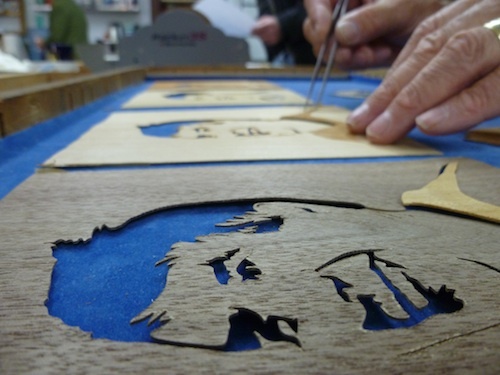 Copyright © 2013 American School of French Marquetry. All Rights Reserved.